View More In Cabinet Hardware - Page 5. 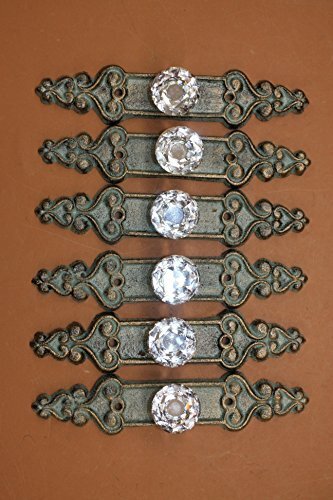 DIY Elegant Antique-style Luxurious cast iron drawer pulls. These are solid cast iron and very durable. They are finished in a nice bronze-look finish which inhibits rust. No hardware provided. Standard size screws will fit the mounting holes. The backplate is 1 1/2 inch wide x 7 inch long. The crystal knob is 1 1/4" diameter and comes out about 1 inch from the backplate. Solid cast iron. Very durable. Three-dimensional design on the front. Mounting holes provided. 2 7/8" apart. No hardware provided. Standard screws will fit the mounting holes. The finish is a beautiful bronze-look finish which inhibits rust. If you prefer a different color, you can easily paint with spray paints to the color of your choice.